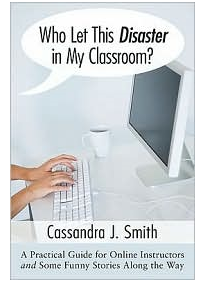 I just finished reading Cassandra Smith’s Who Let This Disaster in My Classroom? : A Practical Guide for Online Instructors and Some Funny Stories Along The Way (2009: Resource Publications). What a disaster! And not in a good way. I bought this book because I was intrigued by Tony Bate’s review in his blog. Tony had noted that he was not even sure he should have reviewed the book, but the author had sent him a copy, so he did so. He noted what he liked about the book (Smith let it all hang out and bared her soul), what upset him about the book (the fact that she was hired to teach when her only credentials were a degree and having taken courses online), and what was bad about the book (the continual whining about her students and the lack of any research regarding best practices for teaching online). Tony was spot on for all three categories. One of my first thoughts was wondering how this book ever survived the peer review process. So I checked Resource Publications. It turns out that they are a part of Wift and Stock Publisher, who publish “new works in theology, biblical studies, church history, philosophy and related disciplines.” Their vision is to “publish according to the merits of content rather than exclusively to the demands of the marketplace”. So not a vanity press she published herself, but also not an academically rigorous publisher either. It explains why while reading this book, I could not figure out whether it was a guide to online teaching told by someone very religious or a religious guide book told by an online teacher. There definitely was no blurring or separation of church and state in this book! Cassandra Smith has only taught online for a couple of years, yet she sees it as her life calling. I could not help but feel sorry for her students, and hope she grows into a better teacher. Her book was entirely about control. She noted in several places that she was the expert because she had her degree and blasted her students for daring to try and help each other out. This book so flew in the face of building a community of learners that I had a hard time finishing it. In the review I left at Barnes and Noble, I stated that the subtitle was A Practical Guide for Online Instructors and Some Funny Stories Along The Way – and that Smith delivered neither. 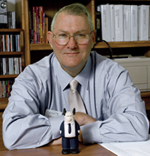 I suggested that if online instructors were truly looking for best practices, they should check out Susan Ko’s Teaching Online, Palloff and Pratt’s Building Online Learning Communities, and Shirley Waterhouse’s The Power of eLearning. As Tony noted, the book is more a damnation of hiring practices that throw adjuncts at online courses with no preparation. It was apparent that she was teaching off of a pre-written course with no guidance. Her “disasters” are symptomatic of what happens when an institution focuses on instructional designers building courses but not on their delivery. She worked through her disasters, but not necessarily in ways that made sense from a good technological pedagogical content knowledge basis. I commend her for writing a “how-to” guide, but she needs more experience, more training, and more research before she should do so. Thanks for the warning and links to useful resources.